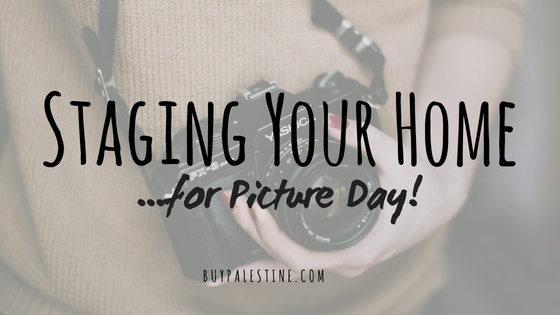 Palestine Real Estate & Palestine TX Homes For Sale | BuyPalestine.com Staging Your Home...for Picture Day! PREPARATION IS KEY – Just like grooming yourself for picture day at school, your house needs to be ready for it’s closeup! Before photo day, purge the house of unwanted clutter including knick knacks and unused items and give it a thorough cleaning. Mow the yard, clean off the porches, make the beds, neatly stack items in the garage…you get the idea. Basically, straighten up as much as possible. You’re going to be moving soon anyway, so might as well get a head start! Photo editing can work wonders, but it isn’t a magic wand. You can adjust many parts of a photo, but it is nearly impossible to edit out clutter and lack of cleanliness. Bottom line: you can never over prepare your house for photos, but you should certainly try! AS IT ACTUALLY LOOKS – The pictures should showcase the home as of today. Not what it would look like with a pool, not what it would look like with a new paint job, not what it would like like on Mars and not what it looked like in that winter of 1997 when it snowed once. You get my drift here…good, clean and current photos. Yes, the winter wonderland photos are beautiful, but the house does not look the same as it did then and it so rarely snows here that it is just out of place. Ideally, the photos are as recent and as realistic as possible. Old or overly enhanced photos will only do one of two things—disappoint viewers once they arrive or prevent buyers from ever coming to view in the first place. A LITTLE MYSTERY IS OKAY – You want to show a true to life depiction of the property with photos, but that doesn’t mean you need to show everything. The interiors of closets and pantries are usually a good photo to skip—unless it is an amazing walk-in with custom shelving and is meticulously organized or something worth really highlighting, some details are better saved for the showing. No doubt about it, pre-picture day grooming is a chore, but it is a must to sell quickly and for top dollar. So press those metaphorical shirts, curl that hair and rosy up those cheeks! If you take the time to present the property in the best possible light, it will payoff not only in spades, but in many many dollars. Lisa Priest loves picture day and is a Palestine, Texas Broker/REALTOR® with Picket Fence Realty, Inc. You can reach her via phone or text at 903-948-3343 or read more at BuyPalestine.com.